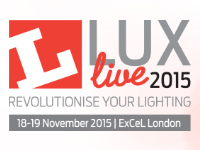 Indelague Group, through Roxo Lighting brand, has participated in LUX Live exhibition, which was held at ExCeL London, in London, from the 18th to 19th November 2015. All visitors and specially our clients, had the opportunity to know our latest news & new products, namely: LED lighting solutions, product range either architectural or technical lighting, products oriented for energy saving, energy efficiency and power control systems. Our participation at this fair was a great success, with strong enthusiasm, interest and engagement from all visitors and represents a new step on the increase and consolidation of brand awareness and position of Indelague Group in the international/European market, namely United Kingdom.